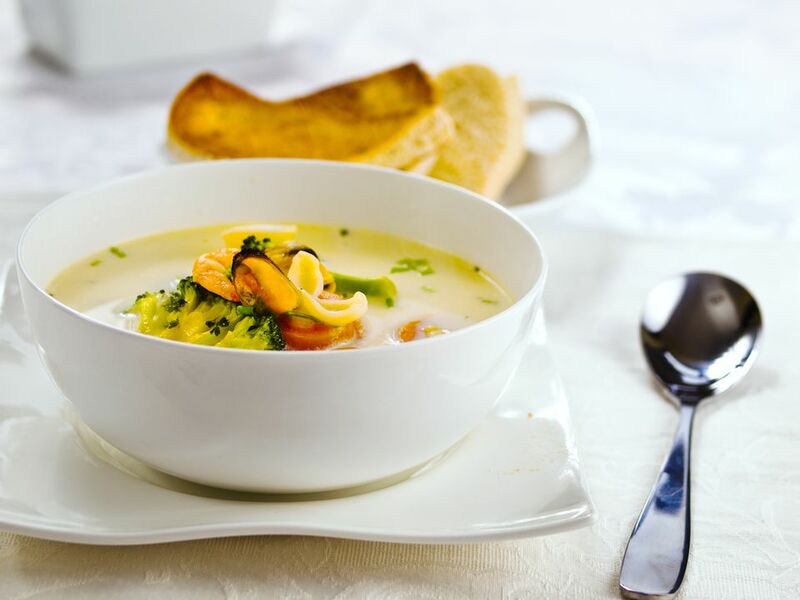 If you like conch chowder, try this version using calamari. It is thick and hearty with robust flavor and just enough spiciness to tickle the tongue. This recipe calls for both the squid tubes and tentacles, but if you don't care for the tentacles, simply use an equal amount of the body instead. This method adds the squid rings last so they remain tender with little cooking. Serve in a bread bowl or accompanied by a crusty artisan bread, if desired. Place chile, thyme, oregano, bay leaf, and allspice berries in the center of a double piece of cheesecloth. Bring up corners and tie into a bundle. Set aside. Separate the tentacles from the squid body tubes and set aside. Slice the body tubes crosswise into rings down to the tail-fin and place in a separate bowl. Place the tailfin pieces in a food processor and pulse until coarsely chopped or hand-chop with a sharp knife. Add the chopped squid to the tentacle pieces and set aside. Place diced bacon in a heavy Dutch oven over medium-high heat. Cook two to three minutes, stirring often until the fat is mostly rendered but bacon is still limp (not crispy). Add celery, carrots, sweet onion, and bell pepper and stir to combine. Continue to cook, stirring often, until onions are limp. Add garlic and cook one additional minute. Add fish stock, tomatoes, juice, Worcestershire sauce, salt, and herb bundle to the vegetables and stir. Bring to a boil and add the tentacles and chopped squid, reserving only the squid rings for later. Continue cooking over medium-high heat about 20 minutes, until tentacles are tender. Add the diced potatoes to the pot and cook until tender, then add the reserved squid rings. Stir into vegetables and cook an additional two minutes until edges begin to curl. Do not overcook. Test for salt and add if necessary. Remove from heat, discard the spice bag, and serve. What Could Be than Beautiful Gypsy Peppers Stuffed With Cheese?